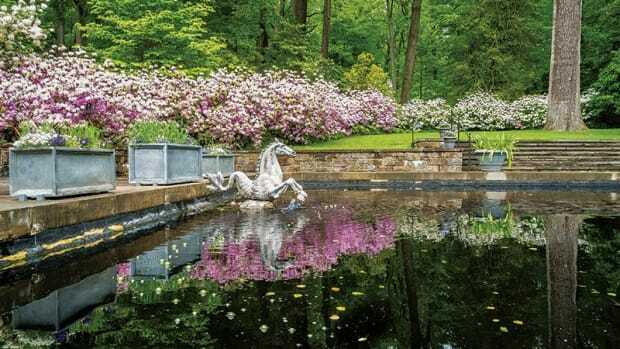 Greenwood Gardens in Short Hills, NJ, is a 28-acre historic garden filled with rustic paths, pools, cascades, exedras, pergolas, walks, terraces and grottos as well as a number of built structures and a Colonial Revival residence. It welcomes thousands of visitors every year. But it wasn’t always that way; until 2011 it was a private garden. 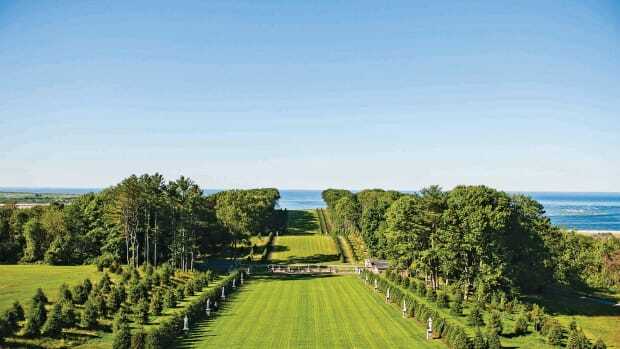 The first chapter in the garden’s history unfolded in the early 20th century when self-made millionaire Joseph P. Day retained William W. Renwick to design his 70-acre estate in Short Hills, NJ, as a refuge from the city. 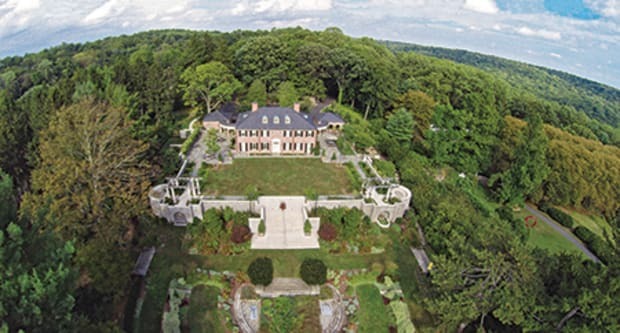 Completed in 1911, it was called Pleasant Days, and included not only the gardens, but also a gilded age mansion. It was a masterpiece of plantings and buildings in the Neoclassical style blended with Arts and Crafts touches. Pleasant Days was in its heyday in the 1920s and 30s. When Day passed away in 1944, the property was divided and sold at auction. In 1949, Peter P. Blanchard, Jr., and his wife, Dr. Adelaide Childs Frick, purchased the house and gardens. They replaced the original mansion with a smaller Colonial Revival brick house, changed the name of the estate to The Greenwoods, and added different plantings over the years. When Peter Blanchard, Jr., died in December, 2000, his son, Peter P. Blanchard, III, decided to donate the estate to the public, following his father’s wishes. He turned to the Garden Conservancy, a national organization based in Cold Spring, NY, to guide the transition. Greenwood Gardens is now open to the public as a garden and a center for the study of nature, historic preservation and conservation. The transition from private to public required quite a lot of planning and work. 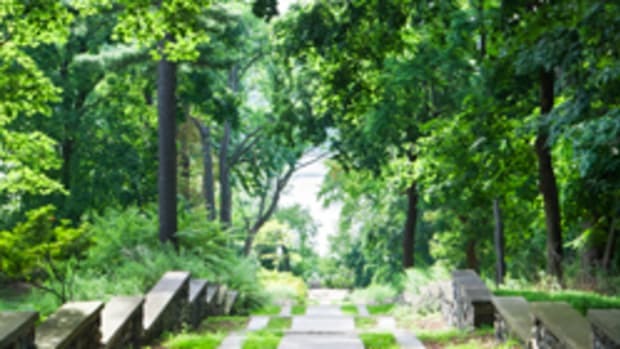 Historic Building Architects, LLC, of Trenton, NJ, and Rodney Robinson Landscape Architects, Inc., of Wilming-ton, DE, were hired to restore the gardens and convert them into a public facility. Parking was provided by paving the old tennis court. A garage on the west side of the Blanchard house was converted into public restrooms. As for lighting, Summers explains that poles were installed within a row of existing conifers so they would be inconspicuous when not in use. The pergolas in the Sundial Terrace during the Day era had been removed during the Blanchard era, but two were reconstructed based on archival photos. 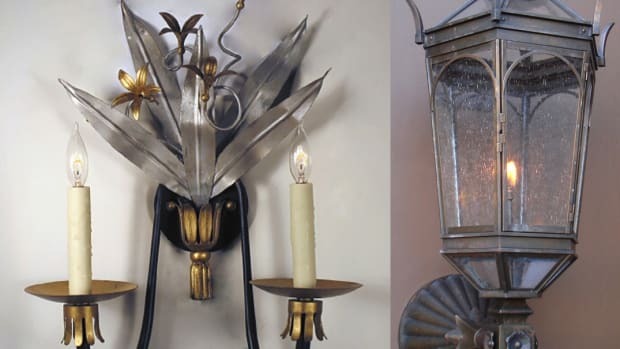 These are located in the east and west corners of the terrace, and are adorned with hand-crafted copper masks of rams, also following historic photos. Two historic masks were also recreated and the beams are topped with rustic, hand-hewn Alaskan white cedar purlins. The retaining walls throughout the garden were a particular challenge. They had disintegrated over the years, and Renwick had designed them so that each wall was tapered at a slightly different angle, to create different perspective views. The architects sought to restore these original architectural proportions using 3-D survey data. Also restored were the benches that were built into the walls and the exedras near the pergolas. New precast paving stones in the terrace represents the Day era in the pergolas with bluestone paving representing the Blanchard era elsewhere. “This was done to show the development of the garden,” says Radcliffe-Trenner. Barrier-free access was provided to areas throughout the site by reconfiguring pathways and stairways. “The entire upper terrace is now barrier-free and a new path has been designed to the west to provide access to the lower main terrace,” Radcliffe-Trenner points out. A large number of different Rookwood tiles found in one of the grottos, were restored and replaced as needed. These included designs of Pan and Dionysus, shells, leafs, balls and squares; they were carefully documented, removed, preserved and replicated by Temple University’s Tyler School of Art Ceramic Studios. 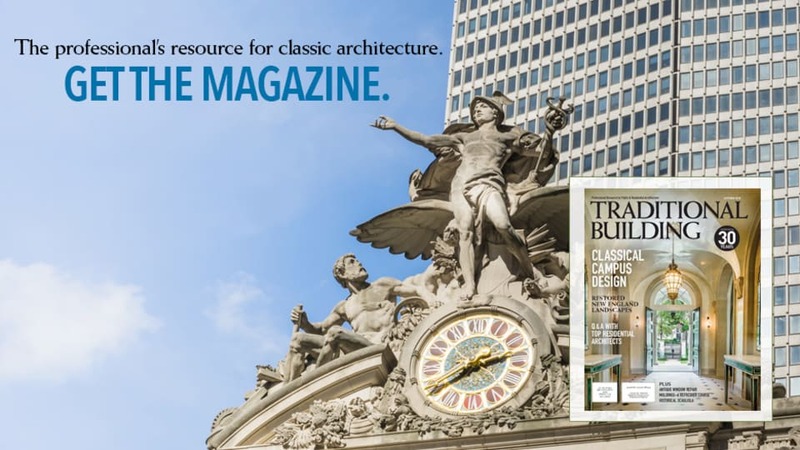 “Using photos taken during the Day era of the 1920s and 30s, we were inspired to design plantings in the spirit of the era, but with a contemporary sensibility and maintenance requirements,” says Summers.